The Ram 3500 is a versatile truck. This truck has a comfortable interior that makes it a nice vehicle for driving around town with family and friends. This truck also has the well-deserved reputation for being a tough truck that is used by working professionals. The interior of the Ram 3500 is designed for usefulness. One important interior feature of the Ram 3500 is the under the seat storage. This type of storage allows for four seats in the truck while there is still space in the cab for important tools that you want to keep out of sight and locked up. The Ram 3500 offers range select within the cab. This feature allows you to set the gears for downshifting when descending hills while pulling a trailer. 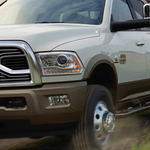 The Ram 3500 is best appreciated by taking it for a test drive. Come to B & B Chrysler Dodge Jeep Ram and test drive the Ram 3500 today.